NFC monitor, track and recover assets worldwide. We provide asset tracking systems to the open market fulfilling the world’s most complex asset tracking requirements. A Complete Farm and Livestock Security Solution. Monitor, Track & Recover Your Farm Assets. Protect Your Livelihood and Your Home. Benefit from Discounted Insurance and Defra Funding with NFC. Do you sometimes feel you’re ‘fighting a losing battle’ against threats from organised rural crime gangs, opportunists, unleashed dogs and cybercriminals? NFC Group’s Smart Farm and Livestock Security Solutions allow you to monitor even the remotest parts of your farm, day and night, so you track, monitor and recover your livestock and assets, and find peace of mind. The Orion Data Network is an active Radio Frequency Identity (RFID) broadcasting system consisting of a central gateway and tags. The weatherproof tags are easily attached to your livestock, farm vehicles and gates and integrated into electric fencing units. The gateway is then plugged into your farmhouse providing an instant network of radial coverage of around 10km, giving you real-time alerts on the location and security of your farm assets, even in the most remote part of your farm. Orion is a high security network that is virtually impenetrable by hackers. 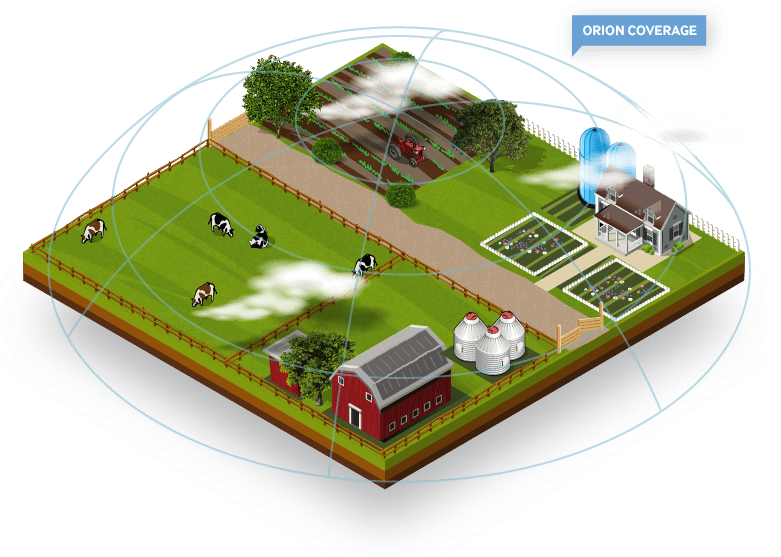 Orion enables you to gain a comprehensive view of and total control over your farm assets, who is visiting, where your workers are located and the health and security of your livestock. In the event of loss or theft Orion helps to achieve fast recovery. It is cost effective and easily scalable for when your farm grows or you require increased visibility or security. Discover the full range of features and benefits of Orion’s solutions for rural businesses and homes. For insight into how ActiveHerdTM, our herd management Bolus solution for cows, works, click here. Rural crime was in decline from 2012-2014 because Farmers had invested in new technology following record thefts. However, now criminals have found ways to outsmart the old technology and we’ve seen a sharp increase in organised raids on quad bikes, tractors and telehandlers, while opportunists are stealing wire, fuel and even farm gates. Cattle rustling is also on the rise with cases of cybercriminals hacking into basic GPS systems to locate livestock and absconding with whole herds of sheep and cattle. In some cases thieves have even made off with the GPS system itself! It’s a sobering thought that arson alone cost rural insurers £50 million in 2016. Although most rural dog owners are responsible, it only takes one who isn’t, or an unknowledgeable visitor from out of town who doesn’t leash their dog, and your farm could be the victim of sheep worrying. Some of the most severe recent cases have resulted in prize livestock having to be destroyed following injury, expensive and dangerous miscarriages, and herds of sheep becoming afraid of the farms’ own herding dogs. Get a discount on your insurance and Defra funding to recoup your investment. Contact NFC now on 44 (0) 1425 485 263 to find out how you can gain an insurance discount and Defra funding. NFC Group is partnering with Scrutton Bland and Markel insurance companies to offer discounted fees to farms and rural businesses who purchase NFC Group’s asset tracking, monitoring, recovery and security solutions ActiveHerdTM boluses. NFC Group are also working with Defra to help rural business owners secure their assets and livestock. When you purchase NFC Group’s solutions for your rural business, you may be eligible for Defra funding to recover all or some of your investment costs. If you want to track and monitor your farm assets and livestock to ensure their protection and safety then contact NFC Group and talk to an expert today. Our experts are waiting to answer your enquiries and help design a solution for you. Fill out the contact form and let us know how we can help you. Our experts are waiting for you. Our experts are waiting to answer your enquiries. NFC will never use any of the details you supply us for any other purpose.